I survived Korea splendidly. But that was luck and, I would say 87%, attributed to meeting a lot of great people. For those who don’t like to leave having a good time to chance, there are a thing or two you should know about the city. Seoul, the capital of Korea, is a bustling metropolis. From history to culture to shopping to foods to night lives, the city has got it all. The Korean alphabet, or Hangul, consists of 10 basic vowels and 14 basic consonants. Created by King Sejong of the Josen Dynasty (1392~1904), the alphabet can be easily memorized in a day or two. Choices include airport shuttle bus, subway, and taxi. Airport shuttle bus is by far the best choice in terms of price and convenience. With eight routes and buses departing every 10~30 minutes, you can simply hop on and enjoy the ride. Again, options include bus, subway, and taxi. The comprehensive subway system, which connects every districts in the city and the surrounding area, is a great way to travel. 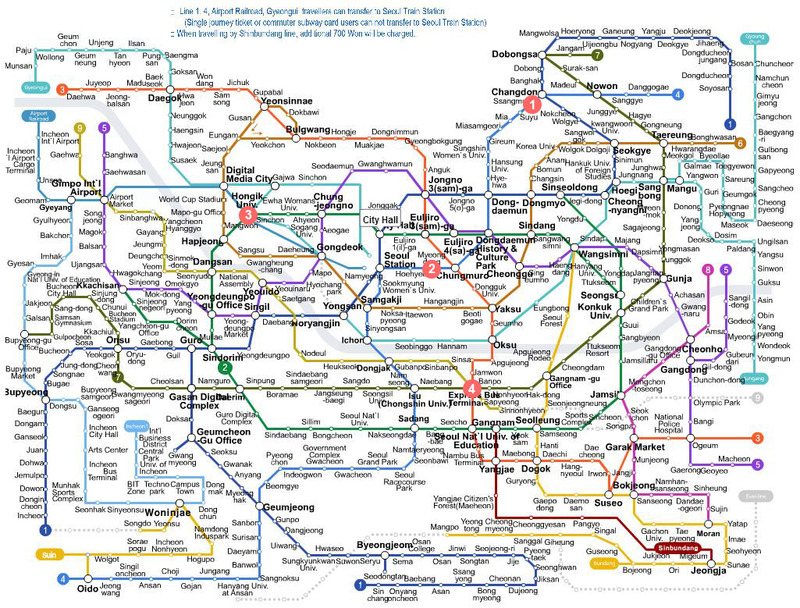 Not only are subway lines color-coded, station names are available in Chinese, English, and Korean. Ssangmun (쌍문) : This is where I lived and my school is just a 10 min. walk away. Hong Ik & Ewha Woman University (홍대 & 이대) : Young, trendy, and popping with students, areas near the two universities offer a plethora of cafes, bars and restaurants, as well as shopping at a budget. This entry was posted in Asia, Dining & Drinking, Travel and tagged korea, seoul, what you need to know on June 10, 2013 by Sherry.